What is a Retractable Banner and How Can It Help Your Business? When it comes to choosing promotional signage for your company, it’s well worth your time to consider a retractable banner. Personalized retractable banners are a versatile, useful, and highly effective choice for companies of all sorts. Available in a variety of sizes, styles, and at a number of different price points, there’s a suitable option for businesses of every sort and size. Here, we’ll discuss what a retractable banner actually is and how it works. Then, we’ll address how these unique advertising tools can help promote your business in a variety of ways. Undoubtedly, it will inspire you to consider the many ways in which a retractable banner could boost your business. First things first... what is a retractable banner? Picture a banner display. Now, picture it having a cartridge to roll into, almost like an old fashioned window shade or a large map which might be unrolled in a school classroom. You’re getting the basic idea behind a retractable banner. Since the entire graphic is wound into a self-contained, spring-loaded cartridge, your imagery is protected when the banner is stored, and unrolls quickly and easily wherever and whenever you want to put out a sign. How can a retractable banner help your business? The benefits of a retractable banner are many. Here, we’ll address six of the top ways in which retractable banners can help your business. The very nature of a retractable sign is that it can be displayed or retracted on demand. It’s simple to display: it’s as easy as setting up a stand and unrolling your graphics. This means that you can have a beautiful sign when you want or need it, but when the event or workday has ended, it’s easy to put it back in its “home” and store safely. This makes it a great option if your signage will be displayed in a temporary setting, such as a trade show, or if your signage needs to be taken in at the end of the day, as in many retail settings. The fact that a retractable banner can be stored in its cartridge means that it’s much easier and safer to transport than a non-retractable sign. The actual graphics are rolled safely, so they won’t be dented or damaged during transport. The sign is compact and fairly lightweight, so it can easily be put in the back of a van or shipped without worry. If you go on the road during trade show season, this can be a really helpful attribute and very handy in allowing you to make an impactful display that doesn’t break the bank to ship. Because retractable banners can be stored safely in their cartridge, they aren’t as susceptible to everyday wear and tear. Unlike a sign that is displayed constantly, it’s not going to be accidentally banged into or touched on a regular basis, nor is it going to be exposed to sunlight or humidity regularly. Over time, these small “wear and tear” moments can add up to dog-eared corners, faded graphics, and overall a less professional sign. While some wear over time is natural, the retractable nature of these banners can extend their life much longer, so that you have a sign that showcases your branding beautifully and lasts for quite some time. A retractable banner offers professional results that make your business look professional and polished in turn. Beautiful, high-quality graphics are one thing, and a retractable banner certainly has them. But simply having a sign isn’t enough: you have to have the means to properly display it. A retractable banner is simple and easy to construct on a trade show floor or in a retail setting in minutes, but offers a professional-looking display which allows your graphics to shine. A retractable display with a banner stand looks far more professional than a poster graphic taped up on a display, and offers you mobility and the ability to place the sign as you wish. 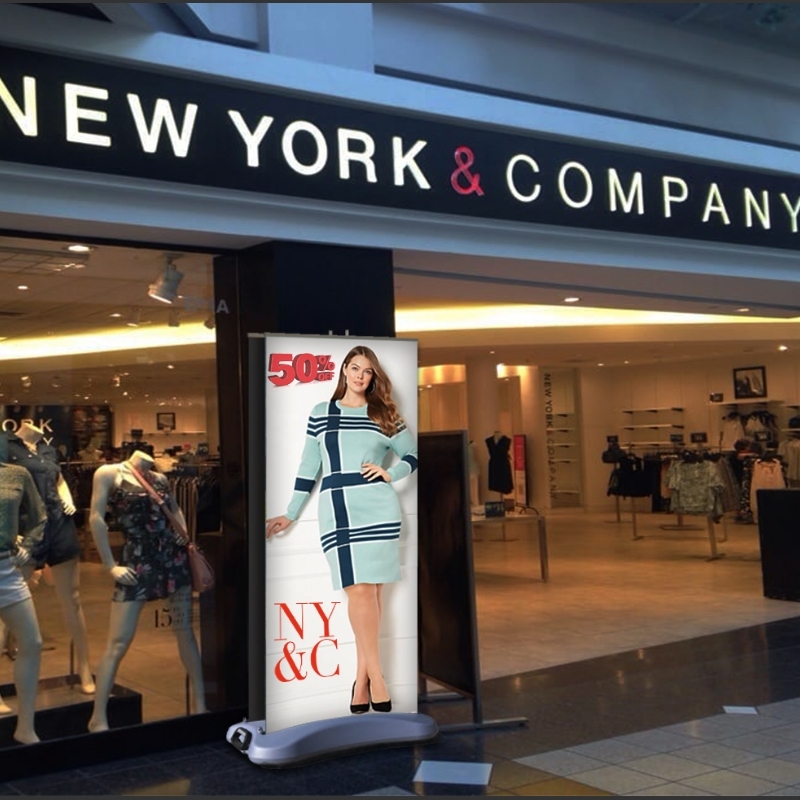 Unlike a static sign, with a retractable banner, you have the opportunity to showcase double-sided graphics on certain models of signs. Above All Advertising offers a number of different double-sided retractable banners which are suitable for indoor or outdoor use. This means that instead of displaying a sign in a corner or against a wall to “cover” the back side, you can display it in the middle of the room or in a trade show hallway and grab traffic both coming and going. This means that you could potentially grab double the traffic. Additionally, it means you can display double the information. 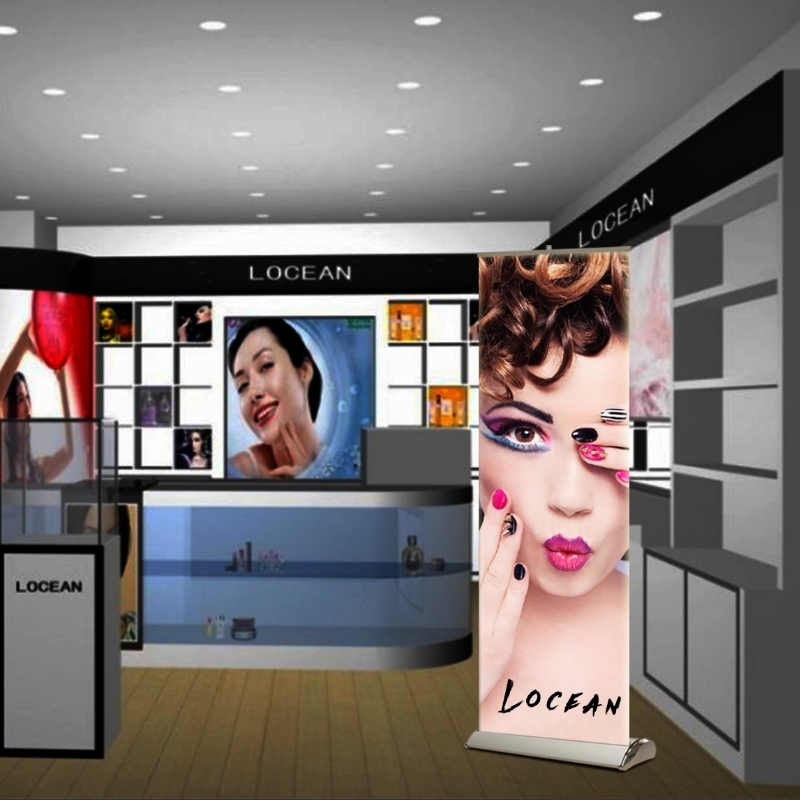 While you could display the same image on both sides, you could also choose showcase a different product or service on the second side so that you have multiple ways to connect with customers. By investing in a retractable banner stand and graphics, you’re opening up a world of display options for your company. First, the display itself. 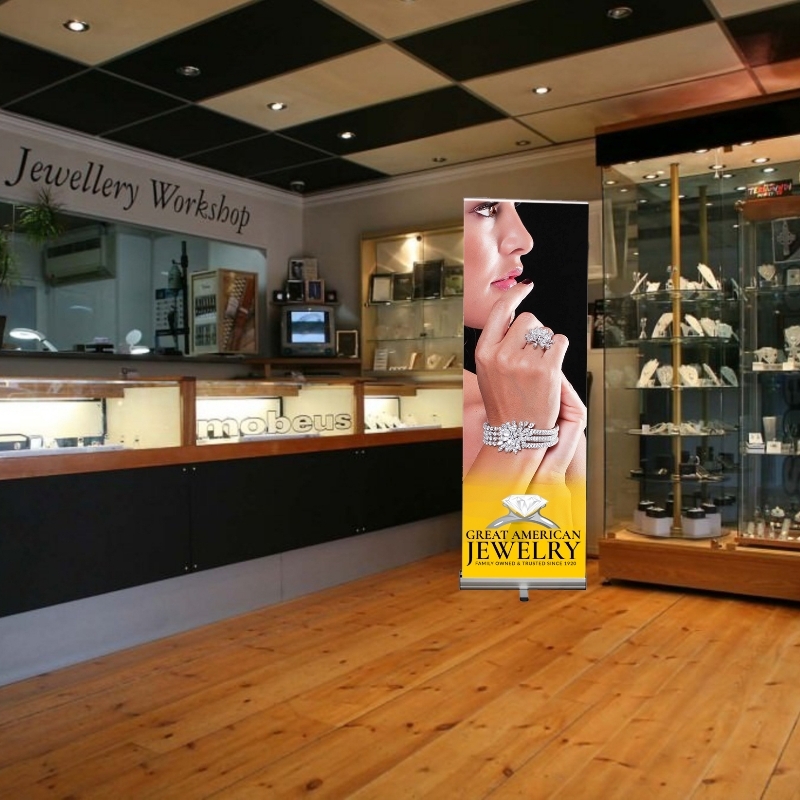 You can choose from a variety of stands, from a simple setup to an indoor-outdoor display, which allows you to make a great choice for the location where you intend on displaying your sign. Second, you have the opportunity to showcase your branding with a wide expanse of banner advertising area. Maybe it will be your logo and website, or maybe a graphic featuring specific products or services. Finally, you can settle on a size and scale that works for you. Retractable banners are available in slim or extra-wide formats, and are available in a standard rectangle shape or can be further customized. When you consider all of these options, the level of personalization you can attain with this type of signage is really quite incredible. 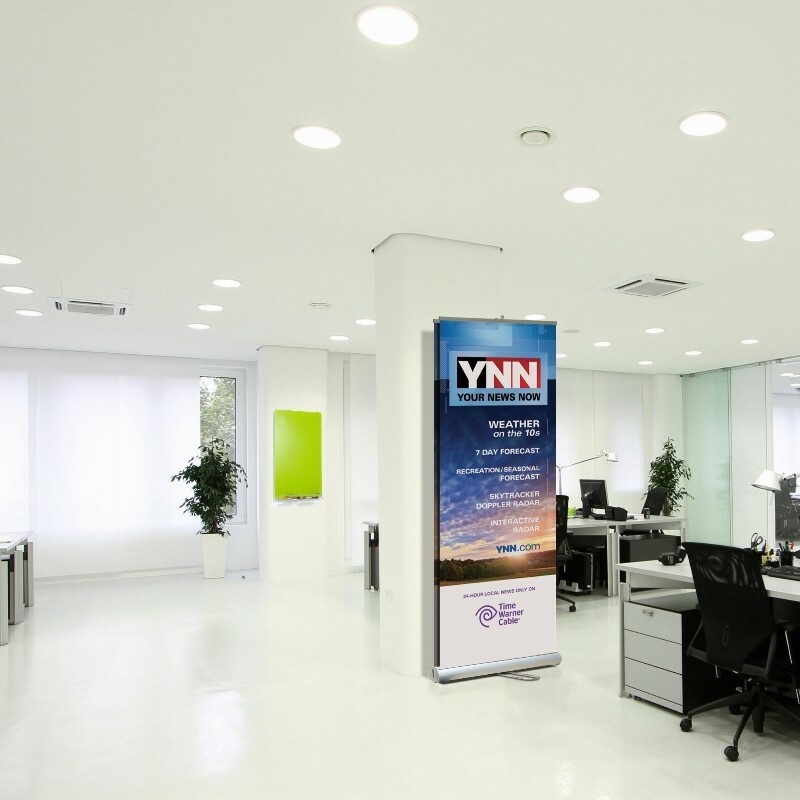 Conclusion: When it comes to promoting your business, retractable banners have a lot to offer. They’re affordable, versatile, and offer an advertising solution which is suitable for a number of different settings, from trade shows to outdoor fairs to retail settings. Check out the wide array of options available on Above All Advertising, and find the retractable banner sign that is perfect for you and your business today. Have you ever used a retractable banner in your advertising efforts?